COMMERCE and Industry Minister Richard Maru has announced the National Government’s intention to enact in legislation to ensure small to medium businesses are reserved for indigenous Papua New Guinea businesses. Mr Maru also told Parliament that a “new Papua New Guinea Banking Corporation (PNGBC) will start operating by early next year to cater for small Papua New Guineans”. The statement from the Minister of Trade and Industry was a bold statement that got a rousing applause from both the Government and the Opposition, as well as people seated in the public gallery, forcing Speaker Theo Zurenuoc to call everyone to order in the House. “As of today, 90 percent of all businesses in the formal sector are owned by outsiders. We only own 10 percent. Thirty-seven years after independence our people have been left to pick up the crumbs,” Mr Maru said. “We sell buai, collect bottles and run second-hand clothing shops when others (foreigners) have taken over all businesses,” he said. “The new PNGBC is coming back, by February or March we will bring in a PNG Business Empowerment Legislation, a very comprehensive legislation, and I will call on the Opposition for a bi-partisan committee to identify which businesses are for Papua New Guineans where no foreigner will run. Mr Maru said another issue that the legislation will address is the ownership of businesses to ensure that there is a requirement for a Papua New Guinean to own 50 percent of any joint venture company designated by law. He said as Managing Director of National Development Bank, he initiated and hosted the Indigenous Business Summit in Rabaul last April to bring to the Government’s notice that “enough is enough”. “We must take back out birthright and we must take control of our economy,” Mr Maru said. “I am happy to announce that last Tuesday, the National Executive Council approved a stimulus package and by today you will see the 12-point plan to arrest the situation we face in the country. “In the budget, we have put K80 million for the National Development Bank in 2013 to make credits available to ordinary Papua New Guineans,” he said. Mr Maru said all the Members of Parliament will have K1 million as part of their District Services Improvement Program funds to support small people in their respective districts to venture into business. “In addition, the Somare Government gave K20 million to NDB to start a new micro-finance scheme for NDB. The buildings are up and they have applied for a license and we hope by December or January they will receive their license and start a new PNGBC,” the Minister said. 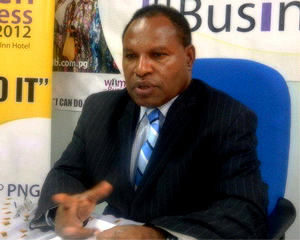 “We hope that our new bank that will replace PNGBC will start opening its doors in January. We need to reduce the cost of all kinds of bank fees and make funding easily available to all our citizens. “So this Government is in support to put funding into NDB to start our own bank and we hope that within the next two years we will have a fully fledged commercial bank that Papua New Guineans own.